Biography: Boniface was born in the late seventh century in England. Though he was educated, became a monk, and was ordained as a presbyter in England, he was inspired by the example of others to become a missionary. The 8th century the Church was international: Rome, England, Germany, Frisia (Holland) were all part of the Boniface’s bio and mission. The Word created the uncommon common culture of the Church. Upon receiving a papal commission in 719 to work in Germany, Boniface devoted himself to planting, organizing, and reforming churches and monasteries in Hesse, Thuringia, and Bavaria. After becoming an archbishop, Boniface was assigned to the See of Mainz in 743. Ten years later he resigned his position to engage in mission work in the Netherlands. On June 5, 754, Pentecost that year, and at sunrise, while reading the Gospel to a group of the newly Baptized, a band of pagan Frisians attacked Boniface and the neophytes. Boniface and the neophytes were massacred. According to reports, Boniface was carrying a Bible and it was stabbed. So his emblem is the one you see here. In Fulda, Germany, are the remains of Boniface along with the purported Gospel book he was holding with slash marks. 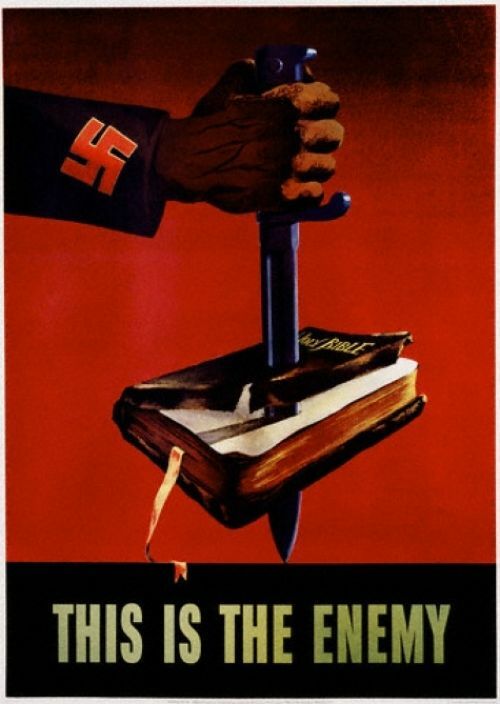 This Gospel book is a good reminder that in the midst of tyranny, the Word of the Lord endures forever and those who hate the Word can come to love the Lord, as many of us have. Boniface died while catechizing. He was around 80 years old. 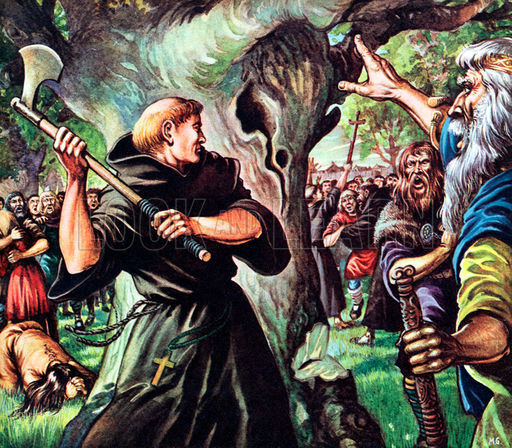 The greatest, most noted and spectacular event in Boniface’s mission work occurred in 723, when he returned to the mission fields in Hesse, “…was to fell the sacred oak tree of Thor (a Norse god), at Geisman in the region of Hesse. When Boniface was not struck down by the ‘god’, many people were converted and Boniface built a chapel in honor of St. Peter with wood from the tree.” (Festivals and Commemorations by Rev. Phillip Pfatteicher) Nowadays progressive Prots and Roman Catholics would probably want to form a dialogue with Norse ‘theologians’, but Boniface and company preached the Gospel, the Bible, Christian morals and catechized and educated the people…without compromising to the pagan worldview nor the corrupt priests Boniface disciplined (1). The Church was built and the Lord was the builder. Even a script writer for The Avengers got it right when Captain America was told to be careful, as he was going after a ‘god’, Thor and Captain America said, “Ma’am, there is only one God and I’m pretty sure He doesn’t dress like that”. He dressed in our flesh in the fullness of time to bear our sin and be our Savior. Boniface was dress in Jesus Christ so that many could hear the Word and be saved. If you want to read more about Boniface read this. It is so clear from the Bible, Church history, as it was in the ministry of Boniface, the mission work of our forebears to this land, who built churches, hospitals, orphanages, schools, colleges, seminaries, that the work of His Church is to build and edify through mortar and in mortals, because God so loved the world He gave His only-begotten Son.